WESTLAKE, Ohio--(BUSINESS WIRE)--The award winning, family casual dining restaurant, Quaker Steak & Lube®, is turning back the clock and re-introducing some of its all-time classic menu items. The throwback favorites are among the most popular menu options throughout Quaker Steak’s history. Additionally, just in time for patio season, Quaker Steak & Lube is rolling out a punched-up beverage menu with winning cocktails created together with national mixology expert, Armando Rosario. Quaker Steak & Lube’s throwback fan favorite menu, available for a limited time, features three sharable appetizers and three specialty sandwiches from menus past. 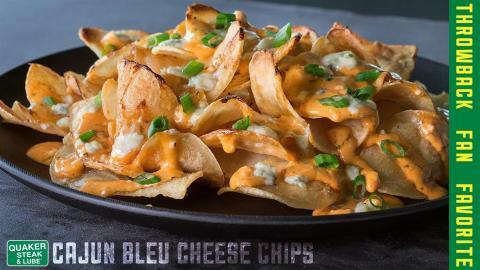 First, are the ever-popular Cajun Bleu Cheese Chips, featuring crispy house-made potato chips with zesty Cajun bleu cheese sauce. 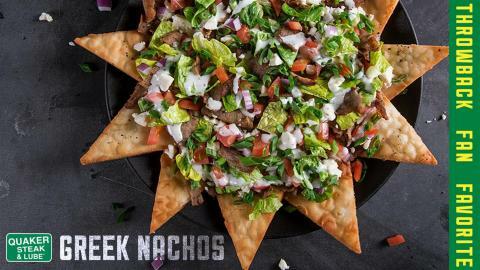 The Greek Nachos include gyro toppings piled high on crispy, seasoned pita chips. 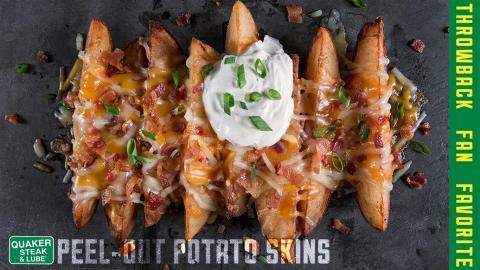 Finally, the Peel-Out Potato Skins satisfy cravings with more potato than skin and come smothered in Cheddar-Jack and bacon. 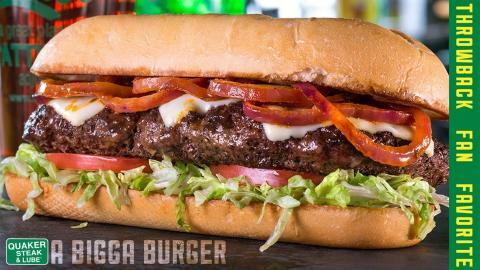 Continued nods to the past come with A Bigga Burger, a full-pound chopped steakburger flavored with signature Lube Seasoning, topped with cheese and grilled onions seasoned in Chipotle BBQ rub and Arizona Ranch® sauce. 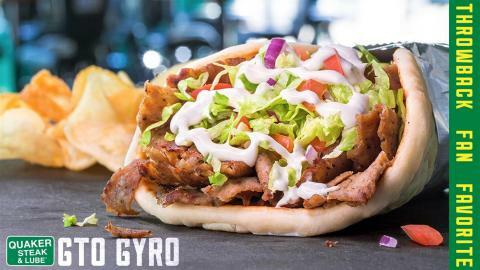 The GTO Gyro features a specialty blend of beef and lamb, served traditional style on toasted pita bread. 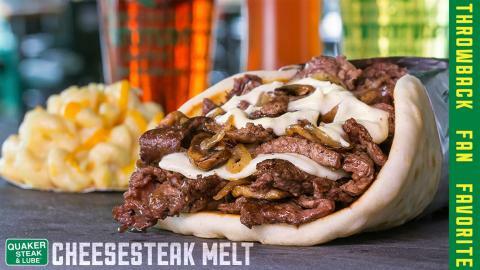 Also, with an aroma that screams summer, the Cheesesteak Melt is piled high with Philly steak, topped with cheese, mushrooms, onions, and a “secret” horseradish mustard sauce. While guests are certain to be pleased with a blast from their past on the dining menu, they are sure to welcome the new beverage menu featuring a variety of masterfully crafted cocktails. The menu features an assortment of Mule drinks, refreshing coladas, margaritas and lemonades showcasing spirit brands such as Tito’s® Handmade Vodka, Bulleit® Rye Whiskey, Gosling’s Rum and Gosling’s Ginger Beer. Quaker Steak & Lube’s beer selections also have expanded to include new IPAs, ales, and cider beers to reflect the budding palates of beer drinkers. “We’re very excited to offer these cocktails crafted in partnership with Armando Rosario,” shared Bruce Lane, vice president of operations. “His philosophy of keeping things fresh and simple has paired well with our desire to offer guests a new variety of specialty drinks crafted with quality ingredients and liquors,” he added. Quaker Steak & Lube’s new menus are the perfect accompaniment to summer patio dining and fun. Guests can enjoy flavorful meals and handcrafted cocktails surrounded by the unique atmosphere of motor-themed décor and variety of outdoor summer entertainment. From the largest weekly Bike Nites held throughout the summer, to Classic Car Cruise-Ins, to live bands, to karaoke, Quaker Steak & Lube has it. For sports fanatics games, matches and races are aired on huge TV screens. Guests can find location event information at www.thelube.com. Follow Quaker Steak & Lube on Twitter and Instagram and on Facebook. For more information, including locations, menu and online ordering, visit www.thelube.com. The Quaker Steak & Lube® brand includes nearly 50 locations in fourteen states across the U.S. Quaker Steak & Lube restaurants combine unique décor, including gas station memorabilia, classic cars, motorcycles, and race cars suspended from the ceilings with crave-able food and high-octane entertainment events. Quaker Steak & Lube has won hundreds of national and international awards for its food and more than 20 wing sauces. For more information about Quaker Steak & Lube, please visit www.thelube.com. The TA Restaurant Group includes more than 880 quick service restaurants, full service restaurants, and ten proprietary restaurant brands including Quaker Steak & Lube®, Iron Skillet and Country Pride. The TA Restaurant Group is a division of TravelCenters of America LLC. For more information about TA and the TA Restaurant Group, please visit www.ta-petro.com. For more information about Quaker Steak & Lube, including franchise opportunities nationwide, please visit www.thelube.com. 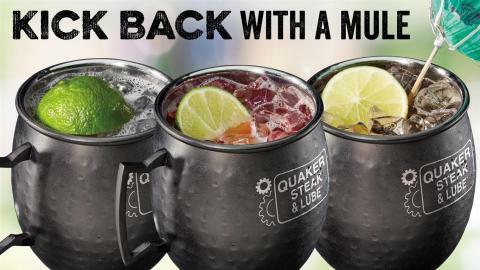 Quaker Steak & Lube® is turning back the clock and re-introducing some of its all-time classic menu items.